Most young children have tantrums. Typically as they master new skills and become more savvy with expanded communication abilities the tantrums dwindle away. Autistic children have meltdowns and these meltdowns can happen across the life span. For some autistics they never totally disappear. To the casual onlooker an autistic meltdown and a temper tantrum may appear to be the same behavior. It is not. Autistic meltdowns typically occur as a response to being overwhelmed. Sensory overload is one way being overwhelmed occurs, but becoming overwhelmed can happen in many other sorts of situations. Because the processing of the autistic brain often is not in sync with real time, anything from too many choices to not being able to pull up solutions to an in-the-now problem to an intense emotion that is stuck rather than dissipating over time can be triggers for a meltdown. A meltdown can occur across the lifespan and will not stop until the energy is spent. In fact, giving an individual a favored item or promising a special privilege will not stop a meltdown once it has begun. Likewise, withdrawing your attention will not stop the meltdown. 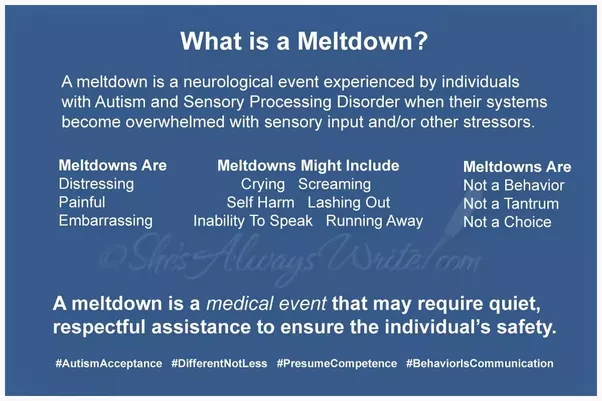 In fact, some individuals experiencing meltdowns may not be able to calm themselves even after the meltdown energy is spent. They may need assistance to calm. This is where a learned calming routine comes in handy. Many benefit from a routine for re-engagement in every day life – a way to get back on track after a meltdown.